Beacon technology can make in-store shopping easier, more enjoyable, and even more affordable for consumers—all perks that could help brick-and-mortar retailers reclaim their dominance over e-commerce—but beyond that, beacons can help you tune into the big picture of your marketing vision. This past June, comScore and UPS's annual retail survey showed that, for the first time in its five-year reportage, online shopping had surpassed in-store: 51 percent of respondents' purchases were made online, up from 48 percent in 2015. While it's true that some people may just prefer the convenience of shopping online, especially when services like Amazon offer same-day shipping, brick-and-mortar retailers can use beacon technology to give consumers incentives that online vendors aren't able to offer. Here's a look at three recent deployments of this technology that show how these little Bluetooth-enabled gadgets can not only drive a sale, but complement and empower an entire ad campaign. Getting a new product on shelves can be a challenge for brands, but perhaps an even bigger challenge is raising awareness of that new product, and appealing to consumers when they're in shopping mode. To draw attention to its new EcoAdvanced batteries that debuted earlier this summer, Energizer used in-store beacons to send push notifications in shopping apps ListEase and Ziplist, as Mobile Commerce Daily reports. This was a brilliant usage of beacon technology because, when shopping, consumers use these apps to discover new things. Energizer got a major energy boost from this campaign, garnering 411,641 in-store engagements. How's that for getting the word out about a new product? According to Business Wire, this summer, Xerox unveiled a campaign designed to give New Jersey commuters another great reason to take public transit: mobile coupons. Xerox put beacons in various transportation hubs, including bus shelters and merchant sites, to target commuters waiting for the train or bus. The beacons targeted in-app users with mobile coupons they could use at that moment in nearby shops. Part of what makes this campaign so special is that it transcended the in-store experience, adding appeal to a variety of local businesses. What's more, Xerox devotes a section of its site to products for small businesses, and offers empowering content on its Small Business Solutions blog—so this use of beacon technology served one of the company's major missions. High-end retailer Barney's is considered the ultimate go-to for luxurious goods, particularly among New Yorkers and visiting tourists—but what's luxury if it's not keeping up with the times? This past winter, Barneys got hip to the digital needs of its shoppers by installing beacons in its Chelsea flagship location, enabling its mobile app users to share rich multimedia content, digital look books, and other relevant content surrounding its in-store items, Digiday notes. The beacons also sent alerts to shoppers about other New York spots they should hit up, and provided recommendations for local dining and sightseeing. By drawing attention to other classic NYC hot spots, Barney's is using beacons, not only to highlight its own products, but to reestablish its position as a New York institution. 1. Want to draw attention to a new product on the shelves? 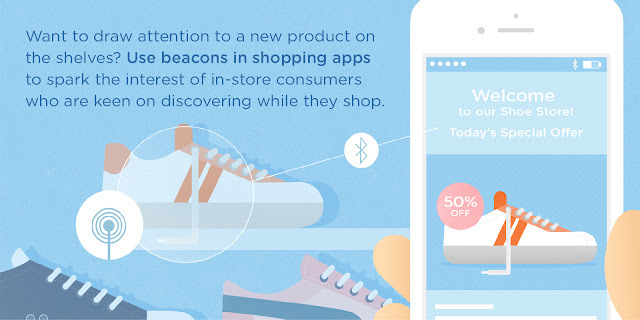 Use beacons in shopping apps to spark the interest of in-store consumers who are keen on discovering while they shop. 2. Beacon technology can serve your brand's philosophy by attracting customers to local businesses, as Xerox did in its NJ Transit campaign. 3. Get up to date with shoppers' digital needs using beacons, and like Barney's did, spotlight your expertise on a region by using beacons to alert customers to other great spots to check out.